1. 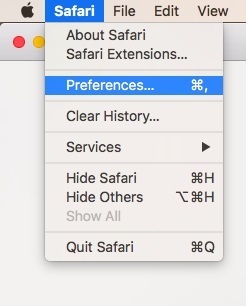 Select the Safari menu, choose Preferences. You can also use the keyboard shortcut which is COMMAND + , (comma) as seen in the picture below. 2. Now that Preferences is open, please click on the Privacy icon, which shows a picture of a hand (in older versions, this may be a picture of a lock, or a silhouette of a person). 3. In the Cookies and website data section, please select Always Allow. 4. If you are using the newest version of Safari (version 11, High Sierra), please ensure that the boxes marked Ask websites not to track me, and Block all cookies are unchecked as shown in the picture below. 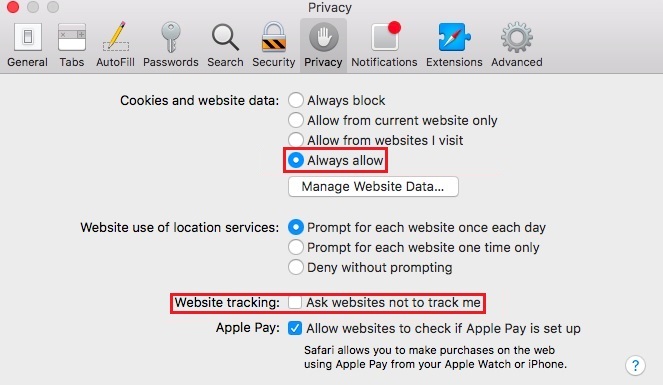 If you are using a previous version of Safari, please ensure that the box in Website Tracking which says Ask websites not to track me is unchecked as shown in the picture below. 5. Close this window by clicking the red bubble in the upper left of the privacy screen. 6. Next, you must quite Safari entirely for the changes to take effect. 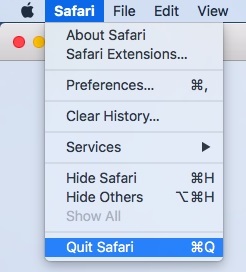 To do this, please select the Safari menu in the upper right of your screen, and click on Quit. You can also use the keyboard command COMMAND + Q to do this. 7. When you restart Safari, the changes will be in effect, and you should have no issues logging in and accessing your online banking. Our online banking is comprised of several different websites that together, provide our members with a complete online banking experience. The particular type of cookie that is used is a "third party session cookie" and it allows a single sign-on between all of the vendor and internal websites that make up the online banking. We request that the settings be exactly as above for the areas within the red boxes to ensure proper compatibility for this reason. If you still continue to experience difficulty or have any other questions, please contact our Member Service Center at 800-479-7928.